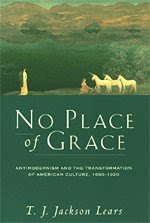 The following essay by NBCC member Tim Brown on “No Place of Grace: Antimodernism and the Transformation of American Culture, 1880-1920,” by T.J. Jackson Lears, a finalist for the 1981 NBCC nonfiction award, is part of the NBCC’s “In Retrospect” series on Critical Mass, in which critics and writers revisit NBCC award winners and finalists from previous years. It is written on the occasion of the 90th anniversary of “The Education of Henry Adams,” first published in September 1918, soon after the author’s death. “No Place of Grace” concludes with an extended meditation on Adams’s career and influence. In the book’s foreword Jackson Lears introduces himself as “a Marxian critic of capitalist culture, whose heroes included Henry Adams and T.S. Eliot, and who actually had a good word or two for religion.” Besides Marx he cites as his influences Weber, Freud, and, especially, Gramsci, espouser of the “cultural hegemony” theory. The book’s reception depended upon where a critic stood on these social thinkers. I agree with Douglas that Lears’s commentary is closely argued, amply documented, and gracefully delivered. Happily, it is also free of lit-crit jargon. After laying out a few Gramscian concepts in the introduction, the author largely sticks to letting contemporaries speak in their own words as recorded in their essays, journals, letters, and speeches. I was largely persuaded by the book’s mound of evidence, and I believe its general conclusions about the American character are solid. "IN RETROSPECT: JACKSON LEARS" was posted July 15, 2008.